This preserved German WW2 Jagdpanzer IV tank destroyer was known as the O-Serie. It was a preproduction model, believed to be made in December 1943. It was fitted with a slightly smaller gun than the later production models. It was armed with the 75mm Pak 42 L/43 anti-tank gun. 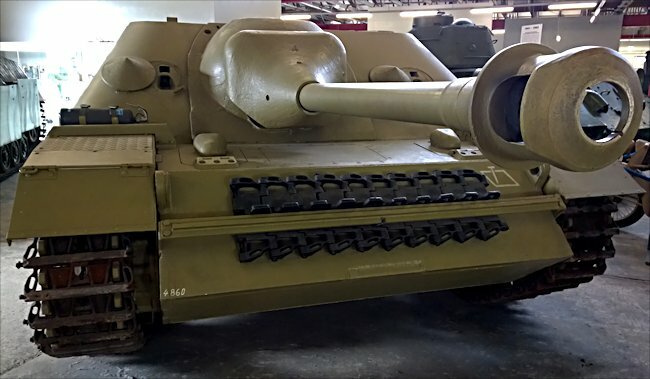 It can be found at the Deutsches Panzermuseum in the small military town of Munster, Germany. The Jagdpanzer IV tank destroyer was a very sleek machine that had an extremely low profile, making it easy to conceal when setting up an ambush and hard to target. It gave the crew all-round protection with well sloped armour. The first really effective tank killer arrived. Prior to the production of the Jagdpanzer IV the majority German tank destroyers were thinly armoured and had open crew compartments. But in 1944 it had arrived too late to tip the balance the war in Germany's favour. 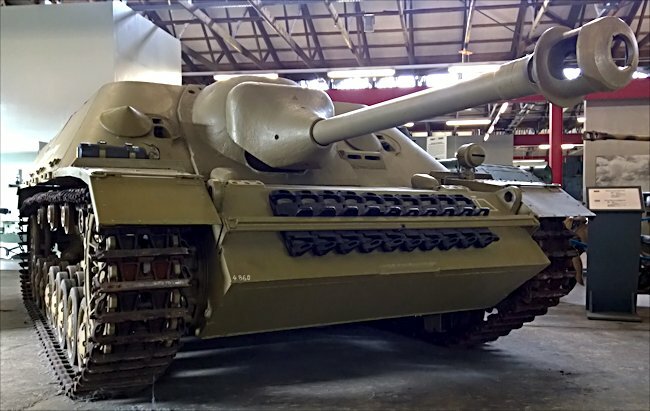 The later production Jagdpanzer IV tank destroyers carried the same 75mm Pak 42 L/70 long barreled high velocity gun that was fitted to the Panther tank. It could carry 55 rounds of HE and AP shells. For close protection it had a 7.92mm machine gun. On 17th December 1944 the Germans were pushing through the Belgium Ardennes at the start of their Battle of the Bulge winter offensive. SS Obersturmfurhrer Helmut Zeiner recorded an account of what happened when his small battle group of four Jagdpanzer IV tank destroyers and a handful of Panzer Grenadiers entered the American held village of Rocherath-Krinkelt. He was commander of 1 Kompanie of SS-Panzerjager-Abteilung 12. "I drove off with my trusted comrades and their Jagdpanzer IVs, through the night and the snowstorm. We went slowly so that the infantry could accompany us. The road was a narrow one but could still be picked out despite the snowdrifts. Then we came to a fork. We took the left handed branch and after a kilometre arrived at the outskirts of Rocherath." "There was no sign of life. We switched off our engines and listened. Nothing. I sent some of the panzer grenadiers on ahead as scouts to find out whether the village was occupied by the enemy or had already been evacuated. Meanwhile I tried to make contact with the following units of our battalion on the radio. In the snowstorm they had turned right where we had turned left. We were on our own. It was then that the scout returned from his reconnaissance assignment to tell me the village was in fact occupied by Americans." "It was now a question of promptly engaging the unsuspecting enemy and capturing the village quickly. The map gave me the impression of a very small village with a church, cemetery and just a few houses. The first sign of the enemy came in the form of infantry fire from in front of the church. I moved forward followed by the other three Jagdpanzer IV tank destroyers in my battle group." 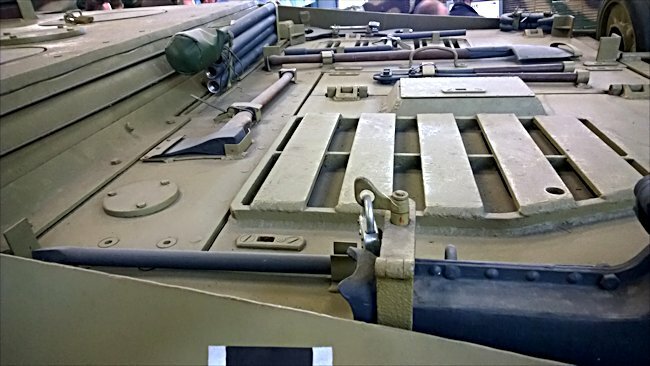 Tools are bolted to the back of the Jagdpanzer IV around the engine hatches. "I had ordered the accompanying Panzer Grenadier platoon to comb out through all of the houses and bring out any on to the street any soldiers they find there after disarming them. But now there was a dramatic turn of events. I stopped my Panzerjager at the crossroads past the church and had the engine switched off. I wanted to listen to get an understanding of what was happening. I heard shots being exchanged behind me. Then suddenly on my right apparently from behind the church, I heard the whirring of a heavy motor." "All I could see was the corner of the large church standing out against the snow covered square which surrounded it. However I suspected that there was an enemy tank starting to move behind the church, so I had our own engine start up again and swung my panzer around through 90° to the right. It was from this position that I saw a Sherman tank was moving back towards me at a distance of only eight to ten metres." "I gave the order to fire with a high explosive round. It caught fire immediately, lighting up the battle area and the church square for a long time. Two of the crew managed to crawl out and take refuge in the church. We let them go unscathed. I then heard the sounds of other Sherman tanks starting their engines from behind the church. We flushed out another M4 Sherman and knocked it out. A third Sherman tank was then put out of action as it wheeled to the right by one of my other Jagdpanzer IV tank destroyers." 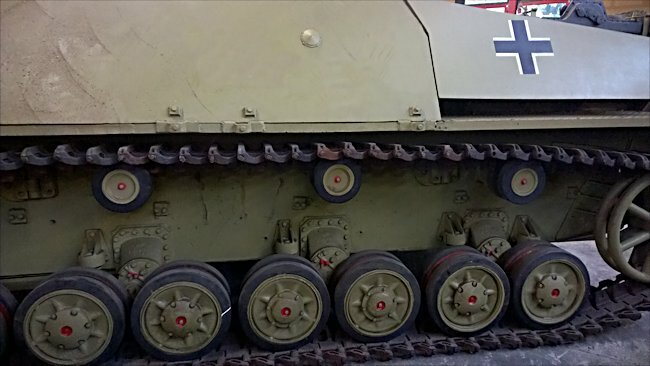 The spare track wheels were carried incase of anti-tank mine damage. 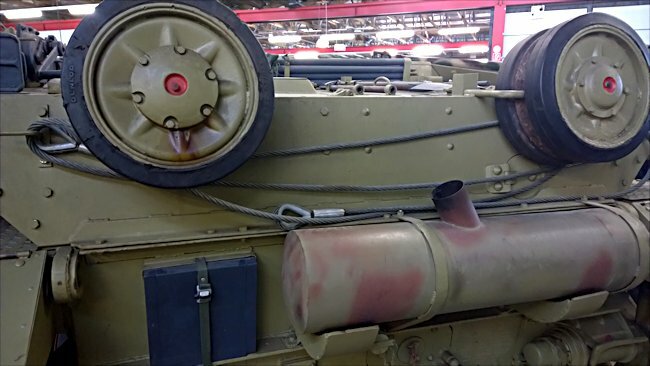 The black square to the left of the Jagdpanzer IV's exhaust is the jack hard point base. On 20th December 1944, during the Battle of the Bulge, Jagdpanzer IV Tank Destroyer were deployed in urban environments. The company commander, Hauptmann Heinz Wewers, of 1 Kompanie schwere Panzerjage-Abteilung 560 was isolated and fought for two days before withdrawing. He was overheard on the army radio commenting on the disadvantage of the Jagdpanzer IV not having a traversable turret when it found itself in close-quarter fighting against allied Sherman tanks. The Jagdpanzer IV Tank Destroyer was a long range ambush weapon. It had a low profile ideal for hiding in woods or farmhouses. It was hard to sport and target. They normally fought in threes or groups of six. They could fire on enemy tanks at long range then retreat to a second defensive location. What happened during the Battle of the Bulge was that they were used as supporting assault guns not as tank destroyers. In an un-cleared village or town in the Belgium Ardennes they were out of their comfort zone. They could easily be flanked by infantry holding Bazookas or concealed M10 tank destroyers or M4 Shermans tanks. 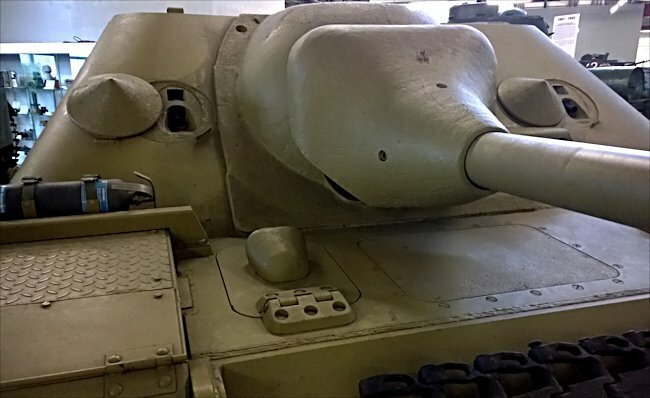 The muzzle Break on the 75mm gun fitted to the Jagdpanzer IV Tank Destroyer at the German Tank Museum, Munster.